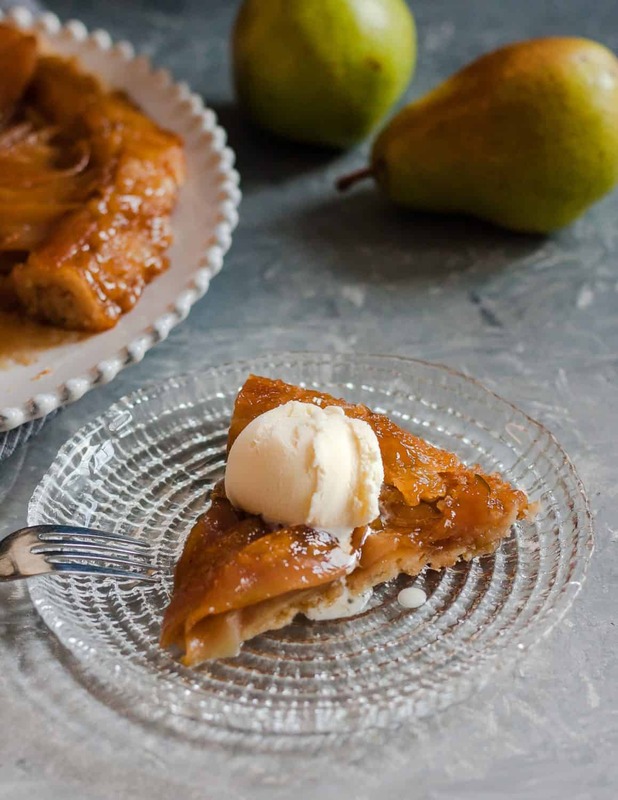 A unique seasonal fall dessert, caramelized pear upside down pie is a great reason to break out the cast iron cookware! I’ve been thinking a lot about seasons, darlings. Not just in the sense of Fall, Winter, Spring, Summer, but in life. Those of you who’ve been around a while will notice I usually start doing this in the transition seasons. And it’s autumn, and the house is quiet for a little while, so it’s a good time for us to talk. 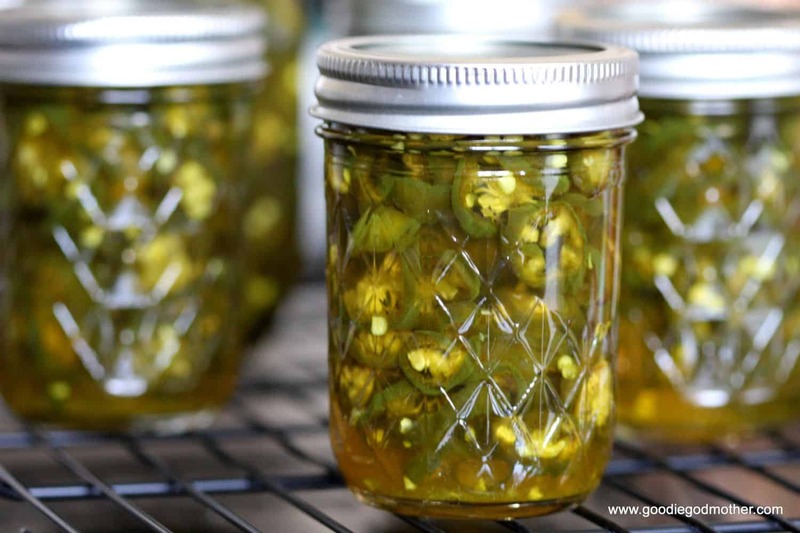 I’m excited to be sharing my first pear recipe on the blog. 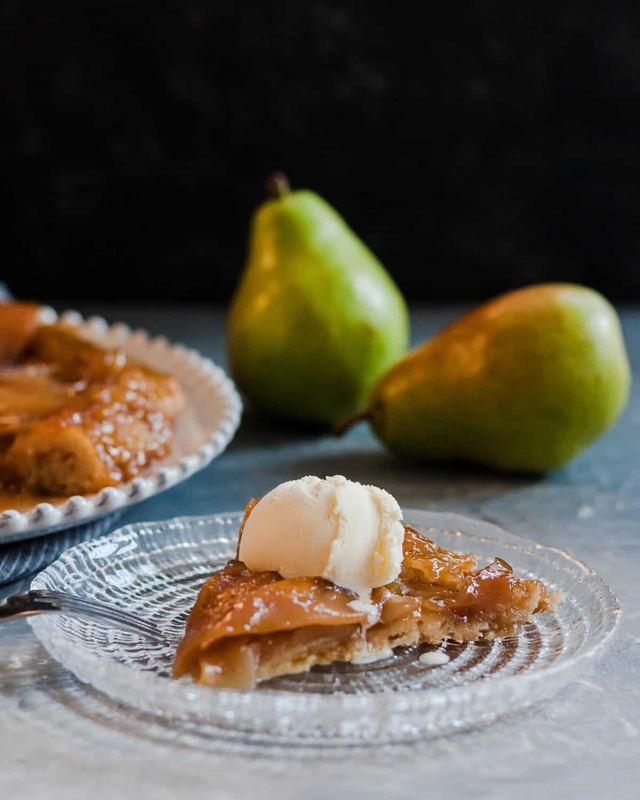 Pears are one of my favorite fruits, so I’m a little surprised it’s taken this long, but there’s only so much time per season and so many recipes. It’s funny to look back at the blog and see what “made the cut” each season depending on life’s season that year. This year is about simplicity and comfort. 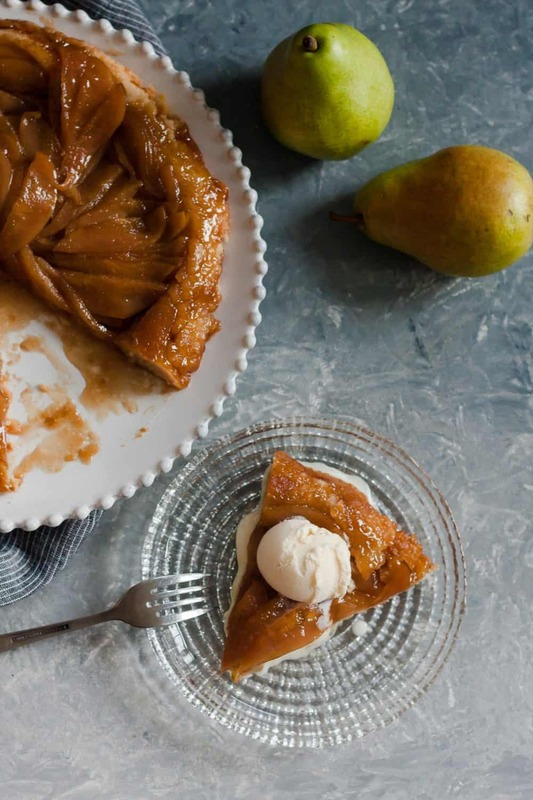 Unfussy recipes, like this caramelized pear upside down pie, where shortcuts are okay. 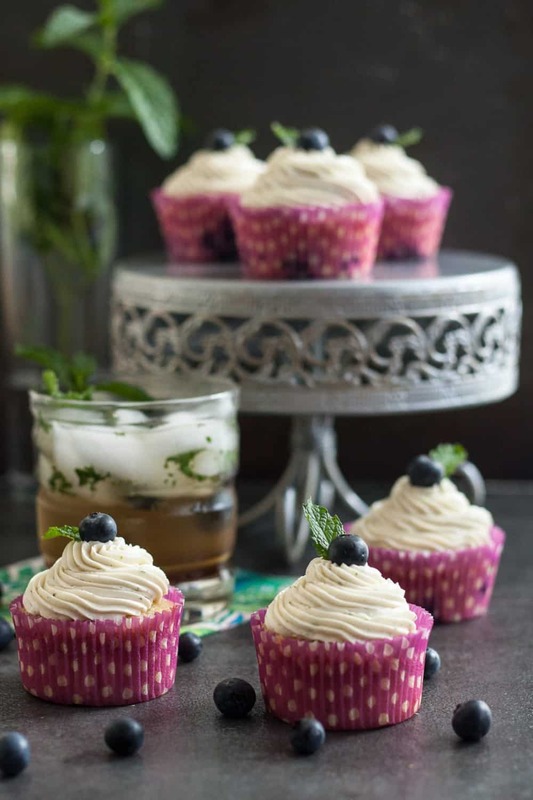 The final result doesn’t have to be perfect, but the flavors are spot on and savored to the last crumb. You may have seen an upside down pie recipe before, it seems they’re common with apples, and sometimes even have a double crust. I spied one with pears in an old cookbook though and haven’t made one with apples since! Personally, I don’t bother with a double crust. For that, we can just make a regular pie with less fuss. 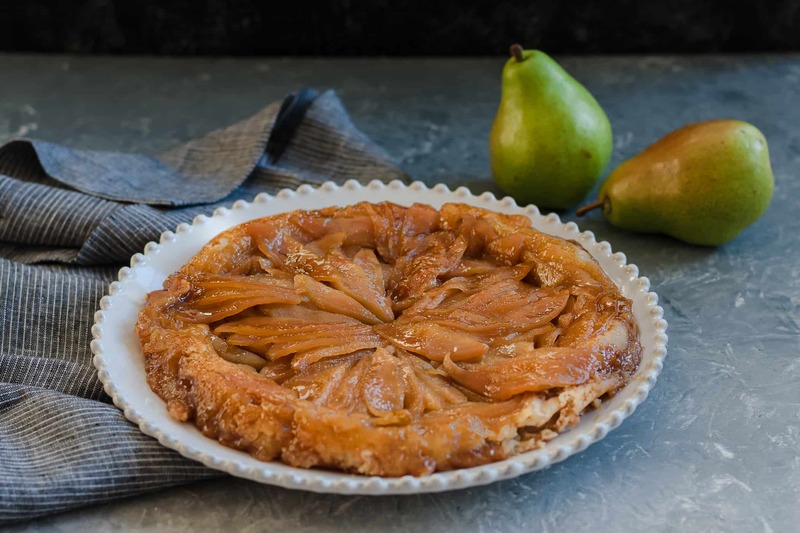 The beauty in an upside down pie is that you start it on the stove top, finish in the oven, and can do fun things with the filling like caramelizing pears. There’s minimal mess, and you don’t really have to get fancy with presentation. 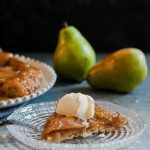 Also, caramelized pear upside down pie is another fabulous reason to pull out your cast iron skillet! Yay! I love my cast iron skillets, and find them an essential for cooler weather cooking. They’re good in summer too, but mine get more use when there’s a chill in the air. I’m working on seasoning 3 skillets for the next 14-17 years or so. One will stay with me, and the girls will each get to pick one to take with them when they’re grown. That way, even if they live far, they can still have a part of “home” in their kitchens. I have three so I keep one to cook for future grandbabies (way way way down the road after graduate school and weddings and all those life steps). Since the princesses are still in diapers and preschool, clearly I’m getting a little ahead of myself. Back to pie. You can make this in any oven-safe skillet, but if you have access to cast iron, use it. You want something where the pears can caramelize on the stove top, yet ideally not stick after baking. Quick note – there won’t be a deep caramel on the pears. Too dark, and you’ll burn the pie in the oven. It’s more of a “blonding”, but it still adds a lovely depth of flavor that really allows the pears to shine. Want a shortcut? 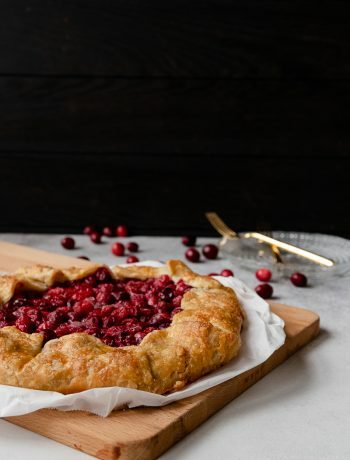 Use a store-bought pie crust. I did for the pictures. Normally, I try to have some homemade pie crust ready, but this season in life for me doesn’t always allow for it. And I found a brand of all-butter pie crust, so that works. I’m a butter pie crust girl. We’ll discuss this more another day. Peel and core the pears, cutting into thin slices or quarters (your preference). Place a 10" cast iron skillet (or stovetop to oven safe skillet) over medium heat and melt the butter. Evenly coat with the sugar and allow to cook for 2-3 minutes. Arrange the pears over the butter and sugar, and allow to cook for 20-25 minutes until fragrant and lightly caramelized. Carefully remove the fruit from the heat. Roll out your pie crust in a circle slightly larger than the diameter of the skillet. Carefully place over the fruit and try to tuck in the corners. Use a wooden spoon to help since the skillet will still be warm. Prick the top of the crust with a fork 4-5 times. Place the skillet in the oven and bake 15 minutes at 400 F. Without opening the oven door, reduce the temperature to 350 F and bake an additional 10-15 minutes more until the crust is a golden color. Allow the pie to set in the pan 5 minutes after removing from the oven. Use a thin wooden or nylon spatula to loosen the crust from the pan, top the skillet with a plate, and carefully invert. 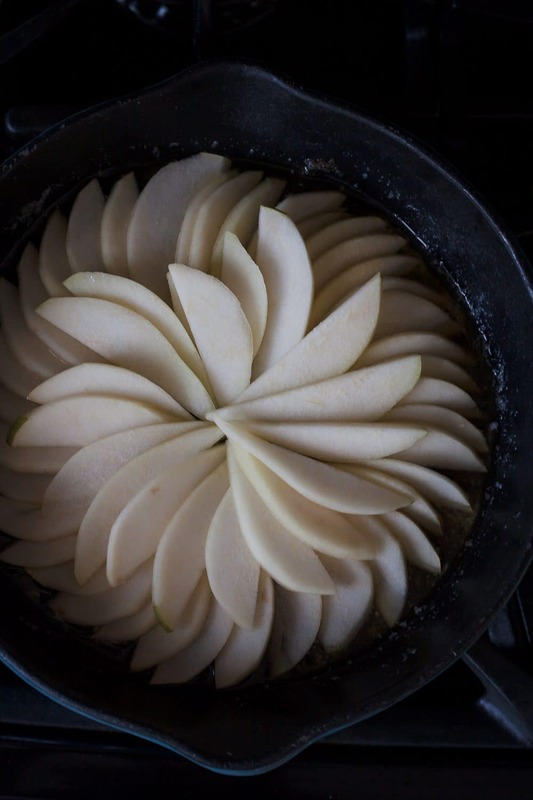 If any of the pears stick to the pan, remove them carefully and place them in the pie. Serve warm topped with ice cream or whipped cream. Store leftovers covered in plastic wrap or foil at room temperature up to 2 days, or refrigerated up to 5.